‘Simpson and his donkey’ has become an icon of the Gallipoli campaign; many children at primary school continue to be taught the history of the Gallipoli landings through Simpson’s story. A definitive account of John Simpson Kirpatrick’s life and war record continues to be debated and rewritten. What is known is that he was born in Britain in 1892, where joined the merchant marine at the age of 17 and began a life of wandering that eventually led him to Australia. He carried a swag, and worked as a cane cutter, a ship’s hand and a coalminer. On 25 August 1914, shortly after the First World War began, he enlisted in the Australian Imperial Force (AIF) under the name of ‘John Simpson’ and began training at Blackboy Hill camp near Perth. It is believed that he was motivated by the hope of gaining a free passage back to Britain so that he could visit his mother. Instead, he found himself in Egypt, and then Turkey. He landed at ANZAC Cove on the first day of the campaign, 25 April, with the 3rd Field Ambulance, Australian Army Medical Corps. He displayed a talent for handling a donkey (or, possibly, a number of donkeys) known variously as ‘Abdul’, ‘Murphy’ and ‘Duffy’, transporting wounded men up and down Shrapnel Gully from the head of Monash Valley to the beach. On 19 May 1915, aged 22, Simpson was killed – shot through the heart on one of his morning forays into Monash Valley to retrieve casualties. His grave is at Beach Cemetery, in the area known as Hell Spit, on the southern end of ANZAC Cove. Some historians argue that Simpson’s story has been exaggerated and romanticised. Claims that he rescued 300 men from the battlefield in three weeks are of dubious provenance. 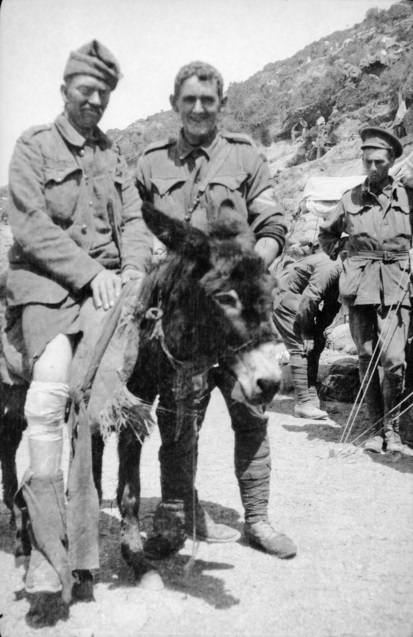 The war diary of the 3rd Field Ambulance simply states that, from 26 April, John Simpson Kirkpatrick took “a donkey [up Monash Valley] to carry slightly wounded cases, and has kept up his work from early morning till night every day since”. Still, there is agreement that Simpson showed courage under fire, even if his deeds were perhaps less spectacular than his legend. He was mentioned in despatches, but calls for him to be awarded a posthumous Victoria Cross have been rejected on the grounds that he was no more exceptional than other stretcher bearers. His role as a ‘medic’ – a man devoted to saving lives – has contributed to his popularity in conveying the ANZAC story to children in particular. Simpson remains, nevertheless, one of the most famous of the men who served at Gallipoli. His fame is all the more notable for the fact that, unlike other celebrated figures from the campaign, such as Albert Jacka VC, he was a non-combatant. Simpson and his donkey are commemorated in paintings and in two bronze sculptures: at the Australian War Memorial in Canberra and at the corner of King William Road and War Memorial Drive, Adelaide. Adelaide was chosen as a site for the most recent sculpture because it was the home base of Simpson’s unit (the 3rd Field Ambulance) for 80 years, until 1995.